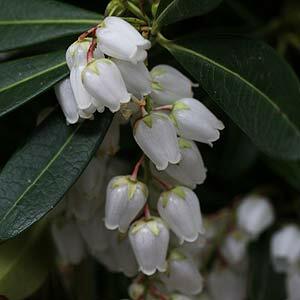 A brilliant flowering plant for light shade, Pieris japonica is also blessed with good foliage. New foliage is often a good red, turning to green as it ages. P. japonica is a highly ornamental flowering shrub with Lily of the Valley like flowers in late winter to spring. A heavy flowering plant, a number of varieties are offered by wholesalers including both white and pink flowering types as well a low growing or dwarf forms. Although these are a plant that require a cool soil and part shade they are very adaptable to a number of landscaping applications. Well suited to shaded positions in urban conditions and small enough to be grown in a courtyard. Also suited to container growing. P. japonica ‘Temple Bells’ – Large white bell shaped flowers, brilliant pink new growth, older foliage turning to deep green. P. japonica ‘Sarabande’ – Pure white bells on a smaller growing bush than most. Flowers are held erect which is unusual and makes them more prominent. P. japonica ‘Snow Queen’ – Very clean white flowers on a medium sized rounded bushy plant. P. japonica ‘Mountain Fire’ – New growth is a deeper red than most, tall growing to 2m +. P. japonica ‘Valley Valentine’ – Deeper pink flowers than others, excellent as a contrast.